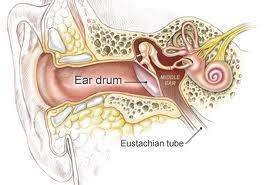 Is The Eustachian Tube Inside The Middle Ear? 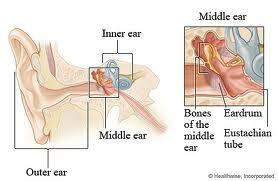 The middle ear is a mucous membrane lined, air filled space, hollowed out of the temporal bone. It contains three tiny bones with three ligaments, two muscles, the opening of the Eustachian tube, the oval window and the round window. The attic of the mid ear, or epitympanic cavity, has an opening which allows air into the mastoid air cells of the temporal bone.The boundaries of the mid ear are the tympanic membrane and the oval window. Mucous membrane lines all of the mid ear; it is a thin layer of tissue containing fluid secreting cells. When a loud sound from the outer ear is received by the mid ear, the tensor tympani and stapedius muscle contract, causing the ossicular chain to stiffen or move out of alignment with each other. The involuntary response or contraction of the stapes is acoustic reflex. When the stapedius contracts in one ear, it also contracts in the other, even if the opposite ear did not hear the loud sound. The oval window is an opening in the bone between the air-filled mid ear and the fluid filled inner ear. It is covered by a thin membrane. The footplate of the stapes is set in the oval window, over the membrane and both are sealed in the in the window by an annular ligament. Sound is transmitted from the ossicular chain to the inner ear through this window. The round window is a membrane covered opening in the bone, separating the middle and inner ear. Although the membrane is in the middle ear, its function is part of the inner ear. The oval and round window is separated by a bony prominence, the promontory. The bulge is the wall of the cochlea in the inner ear. The ossicles are the smallest bones in the human body; their English names are the hammer, anvil and stirrup. Their Latin names in the same order are the malleus, incus and stapes. These bones are suspended by ligaments, and loosely connected to each other to form a linkage known as the ossicular chain. This linkage permits transmission of acoustic energy from the eardrum to the oval window using a lever principle – mechanical energy. The mid ear is a transducer and it changes energy from one form to another. 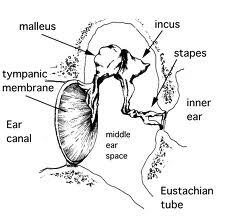 The mid ear transduces acoustic energy from the eardrum to mechanical energy in the ossicular chain. The stapes footplate transduces mechanical energy from the ossicular chain to hydraulic energy in the inner ear. 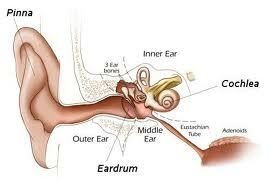 The mid ear is a transformer because it causes an increase in sound pressure to occur. The eardrum is roughly 17 times larger than the oval window. The tensor tympani and the stapedius muscle are the smallest in the human body. The tensor tympani attaches to the handle of the malleus. The smaller stapedius attaches to the neck of the stapes. The other end of each muscle joins to a wall of the middle ear cavity. The Eustachian tube, also called the auditory tube, runs from the lower part of the middle ear cavity to the upper part of the throat. This area, behind the nose is called the nasopharynx. The nasopharynx provides a direct connection for outside air to enter the middle ear through the Eustachian tube.